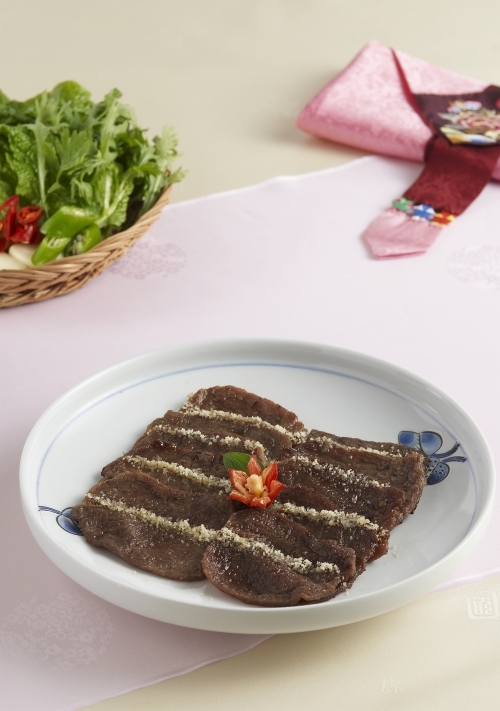 Neobiani is thinly sliced grilled beef with soy sauce seasoning. Neobiani means that the beef is sliced into broad sections. It is tender with a lot of knife slits in it. 1. Clean the blood off the beef, remove fat and tendons, cut into 5 cm-wide, 7 cm-long and 0.3-0.5 cm thick pieces perpendicular to the grain of the meat. Score them slightly and marinate in pear juice for 10 min. 2. Blend ingredients for seasoning sauce. 3. Trim and wash lettuce under running water cleanly. 4. Remove tops of the pine nuts and clean the remainder, pound them finely to a powder. 5. Add seasoning to the beef, mix thoroughly until the sauce has permeated evenly into the beef. Let it sit for 30 min. 6. Preheat the grill and oil. Put the beef on it piece by piece, and grill for 3 min. on one side, and 2 min. on the other at about 15 cm above the heat. 7. Sprinkle the powdered pine nuts and serve with lettuce. Tip: Cut the beef in the opposite direction to the grain of the meat, or it will be tough after it is cooked.